Want to make potato salad just like your mom used to? 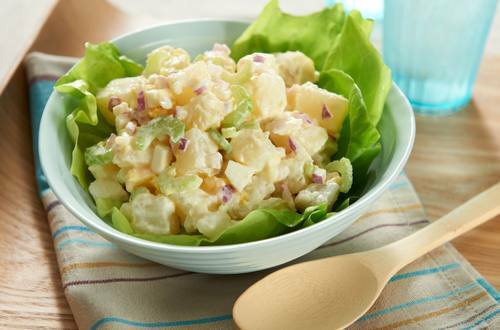 Our original recipe for potato salad is so great because it's made with our real mayonnaise! 1 Cover potatoes with water in 4-quart saucepot; bring to a boil over medium-high heat. Reduce heat to low and simmer until potatoes are tender, about 10 minutes. Drain and cool slightly. 2 Combine Hellmann's® or Best Foods® Real Mayonnaise, vinegar, salt, sugar and pepper in large bowl. Add potatoes, celery, onion and eggs and toss gently. Serve chilled or at room temperature. Also terrific with Hellmann's ® or Best Foods ® Mayonnaise Dressing with Olive Oil.